Just as Twitter reached 50 million daily users, it's testing new "Top News" and "Top People" features. When you perform a search on Twitter, it shows those items related to your search appearing above your results. Twitter hasn't rolled this out on all accounts yet (including my own), but it's something to watch for; both features will increase the relevance of Twitter searches. Have you tried to find a certain celebrity on Twitter who either isn't quite famous enough to warrant the blue "verified" tag or is so famous that the real account gets buried in mentions of their name? If so, you've probably wasted some time hunting up real Twitteraccounts. Now, Twitter puts the verified account at the top of searches in a "Top People" box. "Top News" returns news articles relevant to your search. If it isn't limited to certain media organizations when it rolls out, this feature could really level the playing field for bloggers. It's all speculation until it gets out of the test phase, but niche bloggers could see a real traffic boost if this feature is implemented without restrictions. If your company is in a niche industry and you have the resources devoted to starting a blog, watch "Top News" closely to see if it is implemented only for mainstream media. If it isn't, a niche blog now has even more potential to drive traffic to your site. In the business of soy milk? For example, if your company makes fasteners, a blog about fasteners may seem dry. But if you post industry news and your own opinions to it, someone searching on Twitter for anything related to fasteners may see your blog at the top with a news piece. The same goes for existing niche blogs. You could pay more attention to news from your industry. Do more blog posts based on news, and you may stand a chance of winning the Twitter lottery by having your story posted in the "Top News" spot when users search for relevant keywords. The option to sort your search to include top tweets, or only tweets that include links, would add a lot of value for people like me who blog regularly about many topics. 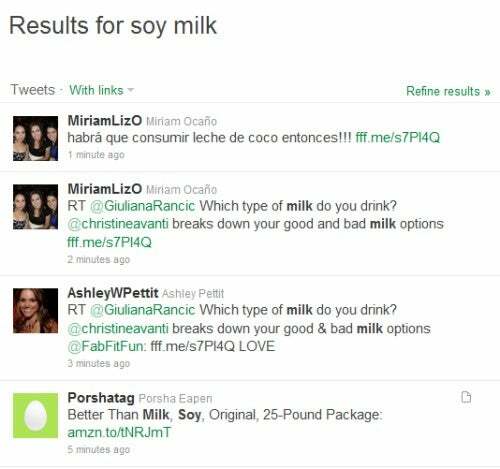 If I'm doing a story on soy milk, I don't have to sort through a bunch of blather about "soy milk"; instead I can move straight to the tweets with links to more substantive information. This extends past bloggers to public relations professionals, paralegals, and anyone who needs to do research daily. that's not to mention that this is a game-changer for how public relations people should tweet; now you have to include links when talking about a product, preferably yours.